Pre-heat oven to 350°F (190°C). In a food processor, blend bread crumbs, flax, parmesan and garlic. Place mixture into a shallow bowl. Brush each pork cutlet with Dijon mustard, then coat with flax mixture. Place pork cutlets on baking sheet. 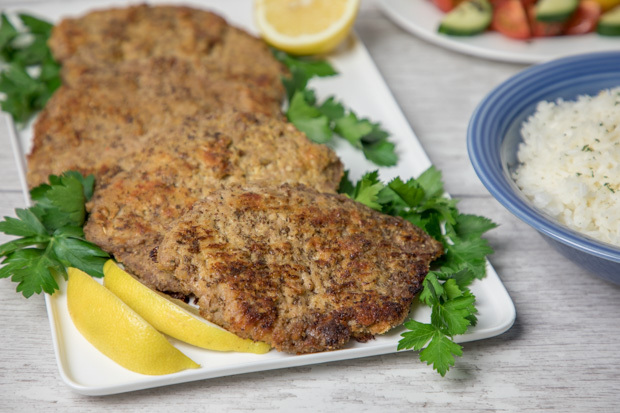 Bake pork cutlets in preheated oven for 25 – 30 minutes or until internal temperature of 145°F (63°C). Serving Size: 1 pork cutlet. Each serving contains 1/2 Tbsp (20 mL) of flax.